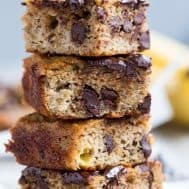 Delicious, moist and gooey, these Chocolate Chip Banana Bread Bars are the perfect quick treat to whip up when you have extra bananas! They’re grain and dairy free, gluten free, soy free, and Paleo. The time finally came – we didn’t finish 40 bananas in a week. I think it was me slacking but it doesn’t matter because I created an awesome grain-free recipe with 2 over-ripe bananas. Since we normally go through bananas like water, this was a special occasion and I really didn’t want to screw it up. The pressure was on, and deliver I did on this one! I didn’t want a regular old banana bread, although I really appreciate a good one. I wanted something a bit different. Gooey, chocolatey and decadent enough to be a real dessert. Something dense that wouldn’t crumble, but also soft. Anyway, this wound up being it and thank goodness, because I was at high risk for recipe heartbreak and you all know how hard that is for me. P.S. These didn’t survive long enough to share a couple with Santa (we loved them and devoured) so I tried another recipe for Santa (cookies) that did wind up failing pretty badly. I mean they were edible, just had an odd taste and too-dry texture. I’d hate to tarnish Santa’s view of healthier treats and paleo in general, but we all agreed we should leave them for him and hopefully he’d be okay with it. Unsweetened almond milk to wash them down. It’s a miracle he still left my kids anything! 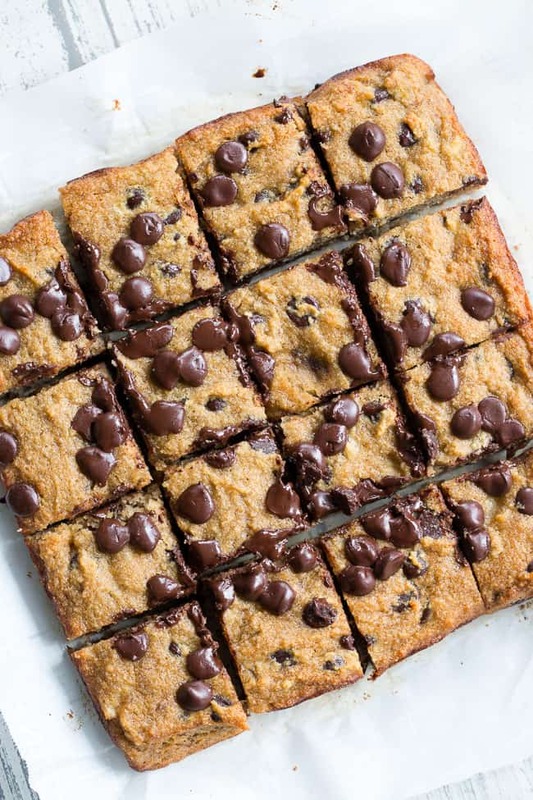 Anyway, because the gooey chocolate chip banana bread squares made me so happy, I didn’t go into full recipe heartbreak mode with that one. Now onto the good stuff! 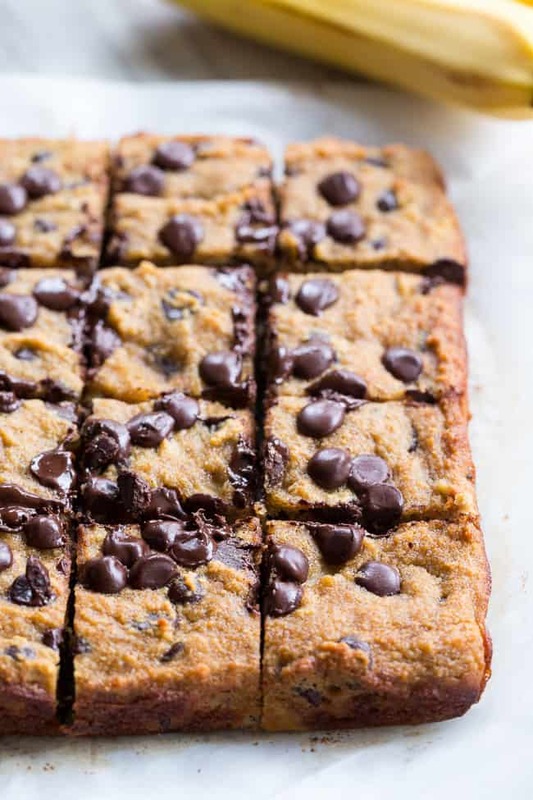 Soft and gooey chocolate chip banana bread squares that are grain and dairy free, gluten free, paleo friendly and 100% delicious. In a large bowl, whisk together the mashed bananas and 2 eggs. Add the coconut sugar, coconut oil, and vanilla and continue to mix until smooth. Stir in the almond flour, baking soda and salt and mix until fully combined. Last, stir in the chocolate chips or chunks. Transfer the mixture into the prepared baking dish and bake for 25 minutes, or until it is set and lightly browned along the outer edges. Let cool completely before cutting into squares to serve. Enjoy! 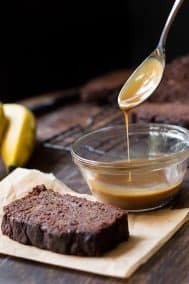 *You can use this recipe to make your own paleo chocolate - simply chill the mixture in a parchment lined loaf pan before chopping into chunks. Do you want to make these yet? I know, I know. It’s hard to wait for the bananas to turn brown. You know I never think to just buy the bananas too ripe to start? What is wrong with me? 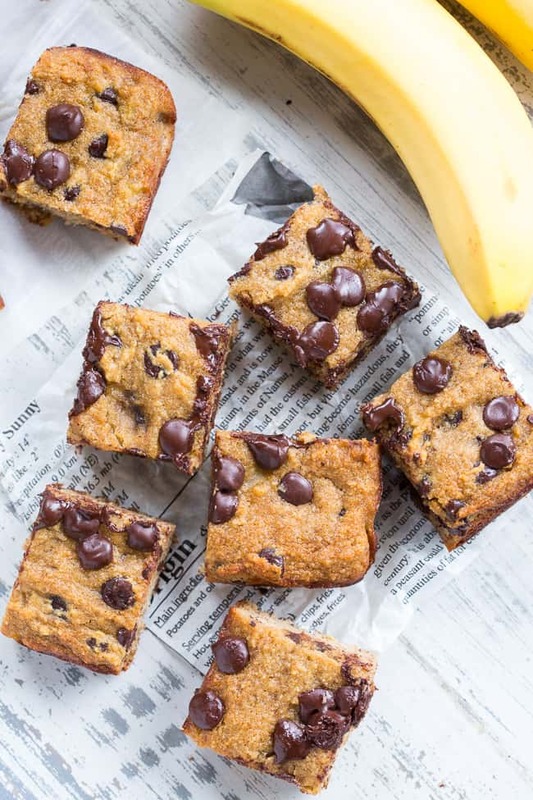 What’s your favorite thing to make with overripe bananas? i may actually have some overripe bananas too on my counter! We didn’t get to eat them all since we were away which means I can make something too! I made two banana recipes recently and, um, I think forgot to write down what I did. Ugh, they were both so good. One was a granola bread. Well, in this case I think it was still a victory, even if you didn’t use all the bananas! I like to freeze my bananas and gnaw on them that way–it’s like a bon bon every time! 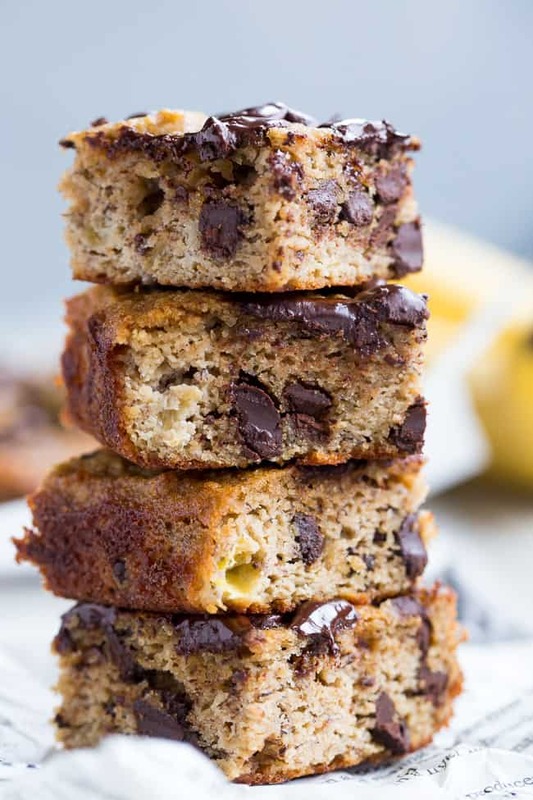 I’m pretty sure banana bread with chocolate chips is like….a must! Banana bread should either be untainted with no add-ins, or with chocolate chips, never anything else! Banana bread is usually my go-to recipe when I have too many bananas. My Christmas was reallly nice – flew by in a flash. Thanks for the recipe and enjoy your Friday! I can’t wait to make these! The perfect pre run snack! Freeze the bananas! They’re great for smoothies and baking. Banana bread is my favorite. Of all the muffins I bake, the banana bread muffin always wins. There’s a ton of ways to change up it too. Love your squares! Yes!!! Bake with the frozen ones. Take them out first to get sort of room temp while you’re prepping your other items. Then peel them and mash. They will be a bit more watery but you can drain off extra water. Works great. And no waste on bananas!! So true! I also feel like I’m either constantly running out of bananas (when everyone’s in a phase) or buying way too many. We are all or nothing with our bananas apparently. The square definitely made them more fun! Great recipe! I was getting tired of making the same banana bread! Lol. We go in phases were bananas are all we eat and then we get tired of them. I think my husband does this on person so he gets some form of dessert.. haha! Yup, same with us! My kids get excited when they see overripe ones because they know it’s time to bake! I cannot wait to try out this recipe!! Awesome! Hope you do, you will love it! I love to freeze my bananas to use in smoothies, etc. This recipe sounds really good, I will have to try it out! I also like making protein pancakes with ripe bananas! That’s a really good idea that I think my kids would love! I have tons of almond milk on hand since I’ve been on a kick lately too. 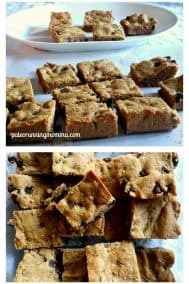 My kids couldn’t get enough of these, and I’m sure yours will love! these look to-die-for! 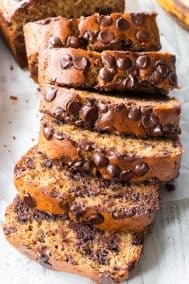 Banana bread is my weakness and i think i’d eat these all! Made these and they were soon delicious that my little picky eaters practically ate the whole thing. Whooooaaaaa….these are CRAZY GOOD! Thank you for saving my sweet tooth today! That’s awesome, so happy you liked them! I made these with sunflower seed flour and they were delicious! Hmm I’m not sure but larger bananas could be the issue. I don’t think that would make it go bad though. Wow! I only had one banana, so I cut the recipe in half and made muffins – I’m amazed! It made 7 muffins, so according to my math (half batch and 7 muffins) that’s about 87 calories a muffin – unbelievable! What a delicious treat! Will definitely be making many times in the future! I just entered all of the info in on my fitness pal and I’m getting well over double the calories – is there any chance you have a breakdown? Thanks!